St. John's wort is a perennial, yellow-flowering plant that grows in the wild throughout Europe and is now found also in North America. 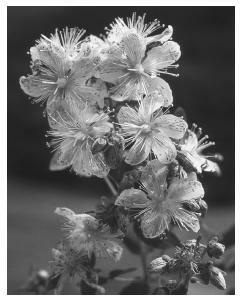 The plant tends to be in blossom in the month of June, around the day considered to be the birthday of John the Baptist; hence its popular name. The plant's Latin name is Hypericum perforatum. St. John's wort has been used as a popular herbal folk remedy for centuries. More recently, practitioners of conventional Western medicine have been exploring its utility for treating depression and anxiety. Writings since the Middle Ages have described using St. John's wort as treatment for inflammation, injuries, burns, muscle pain, anxiety, high blood pressure, stomach problems, fluid retention, insomnia , hemorrhoids, cancer, and depression. Research conducted over the 1990s in Europe studied the efficacy of St. John's wort for the treatment of depression and anxiety. Research protocols have been developed in the United States to study the same issues, to determine appropriate dosages, to develop standard formulations, and to define whether it can be used for all forms of depression or only for more mild forms of the condition. Research has yet to completely explain how St. John's wort affects the brain in depression. It is, however, thought to change the balance of chemicals in the brain in much the same way as selective serotonin reuptake inhibitors (SSRIs) such as fluoxetine (Prozac), and monoamine oxidase inhibitors (MAOIs). The active ingredients are thought to be compounds called hypericin and pseudohypericin, although researchers are attempting to identify other chemicals that may be involved in the herb's effectiveness. The leaves and flowers of St. John's wort are both used. St. John's wort is available as pills, capsules, extracts, dried herbs for tea, and oil infusions for skin applications. Because dosages of herbal preparations are not always standardized, it is important to discuss with a knowledgeable practitioner the most reliable form of St. John's wort. Recommendations call for 300–500 mg (of a standardized 0.3% hypericin extract) three times daily. It can take four to six weeks to notice the antidepressant effects of this preparation. steeped for 10 minutes to make tea. The recommended dosage of tea is one to two cups daily. Again, four to six weeks may be necessary in order to notice improvement in symptoms of depression. Some people may become more sensitive to the sun. Patients taking MAOIs must carefully avoid taking St. John's wort due to serious adverse effects of combining the two. Because the effects of St. John's wort are still being studied, pregnant and breast-feeding women should avoid its use. Depression can be a serious, even life-threatening, condition; therefore, it is imperative that depressed patients using St. John's wort are carefully monitored. Possible decrease in effectiveness of reserpine, warfarin, theophylline, immunosuppressant medications such as cyclosporine, and antiviral drugs such as indinavir. Dangerous interactions when used with other antidepressant medicines (especially MAOIs), digoxin, and loperamide. Interactions with oral birth control pills. St. John's wort may interfere with the effectiveness of birth control pills, increasing the risk of pregnancy; an alternative form of birth control should be considered while taking St. John's wort. In addition, women taking both birth control pills and St. John's wort may notice bleeding between menstrual periods. Blumenthal, Mark and others, eds. The Complete German Commission E Monographs: Therapeutic Guide to Herbal Medicines. Austin: American Botanical Council,1998. Zink, Therese and Jody Chaffin. "Herbal 'Health' Products: What Family Physicians Need to Know." American Family Physician 58 (October 1, 1998): 1133.